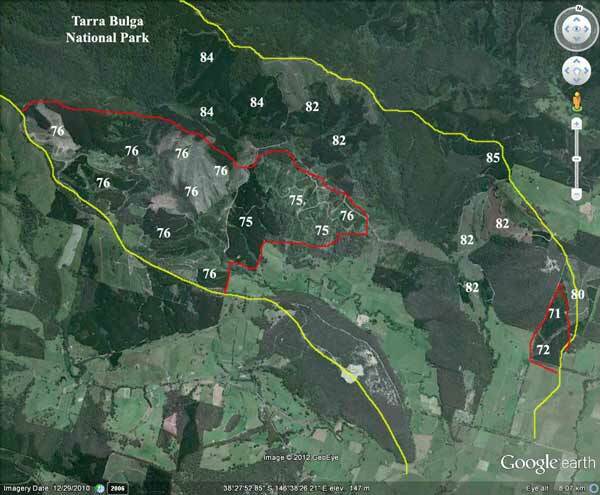 Macks Creek Catchment (between yellow lines) showing extent of plantations within catchment (numbers eg 76 refer to the year of plantation establishment). Most (approximately 300ha) appear to have occurred in 1976. Post September 1976 a concoction of Amitrole (Weedagol T.L. Plus) and (Gesaprim 500) Atrazine may have been sprayed. In 2002 scientists in the United States found that Atrazine at levels as low of 0.1part per billion altered hormones in frogs. Since then Atrazine has been found to have the same effect across a range of animals. 75ha would probably have been sprayed with the Atrazine (4 l/ha/Amitrole 7l/ha) mixture. Totals 300 litres Atrazine, 525 litres Amitrole). The highest risk years for drinking water quality would have been between 1975-8 & 1982-4. 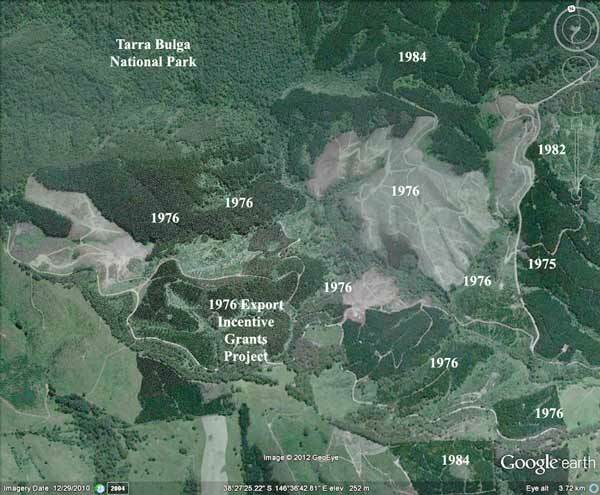 Prior to September 1976, it is highly likely that aerial application of 2,4,5-T @ 1.1 litres a hectare occurred. ~70ha would have been aerially sprayed with 2,4,5-Tin 1975 south of Roberts Road. 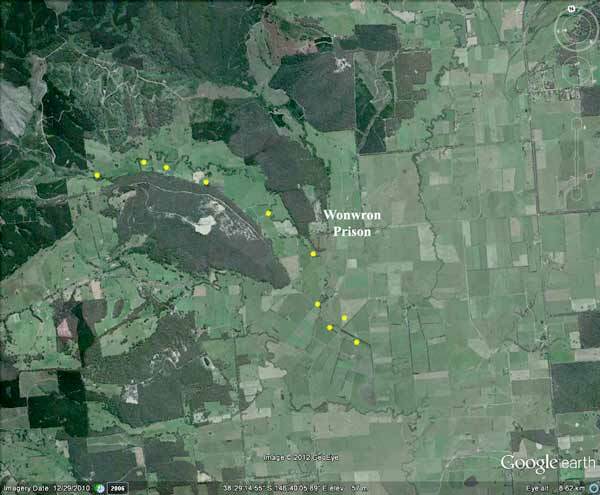 One could concur that 295ha of pine plantations in Macks Creek were aerially sprayed with 2,4,5-T in 1975/6. The areas marked in red show likely areas where 2,4,5-T would have been used. Total amount used 1975/6 would have been 321L mixed with 14,750 litres of diesel. How much of this ended up in Macks Creek? Plantation establishment in the early 1980's may also have used atrazine/amitrole, hexazinone also likely to be used. Hancock Watch understands that up to 30 residents still draw their drinking water from Macks Creek. Houses that could be pumping their drinking water are shown in yellow. Also of interest is that Wonwron Prison (capacity 127) also lay in close proximity to Macks Creek. Where was its drinking water coming from when it was in operation? Wonwron Prison ran from 1964 to 2004 and was going to be then used as an indigenous rehabilitation centre. 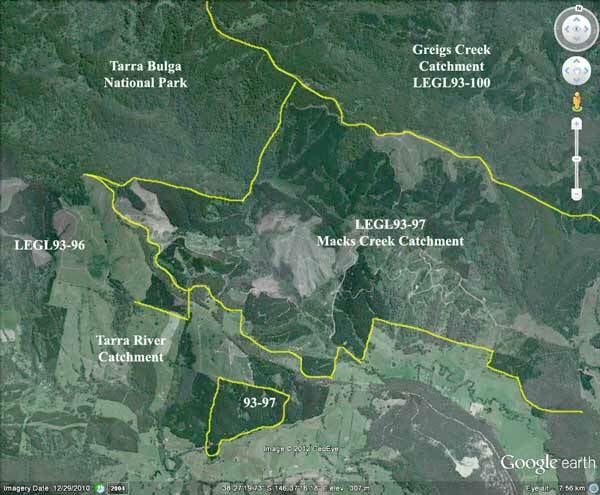 Rough outline of LEGL93-97, almost all of which lies in the Macks Creek Catchment. 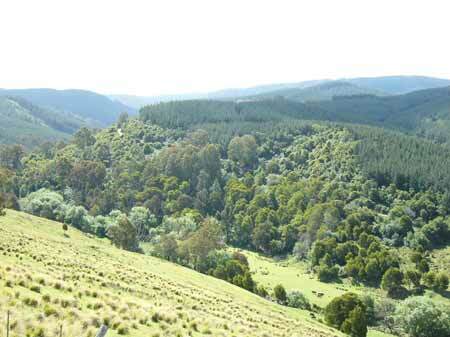 The plantation area also contains approximately 300ha of native forest, particularly at the southern end of the catchment. 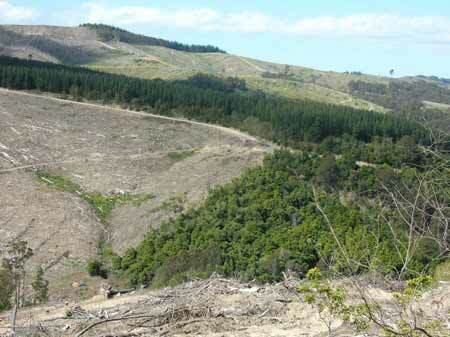 Another 230ha of native forest lies in adjoining LEGL93-98. Macks Creek Warm Temperate Rainforest (where yellow mark is) as seen by Google Earth. Image probably dates from 2005. 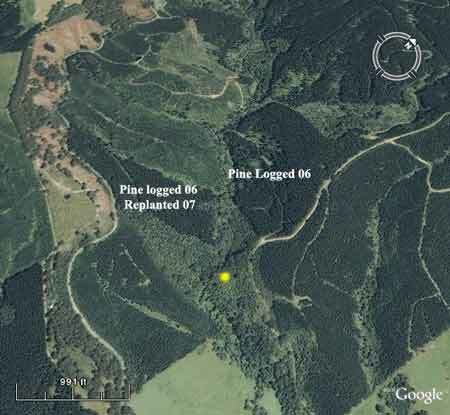 Note incursion into rainforest by pine plantations. June 2003: This plantation area is one of the only areas in the Strzeleckis where you can find Warm Temperate Rainforest. This photo was taken just south of Roberts Road. Strzeleckis warm temperate rainforest is entirely restricted to the lowland valleys of the Strzelecki Ranges in South Gippsland. There are no equivalent vegetation types in previous descriptions of rainforest in Victoria and it does not occur outside the state. Strzeleckis Warm Temperate rainforest is extremely fragmented and was initially cleared by farmers. It is of national importance! Pittosporum undulatum in foreground with yellow 'fruit'. Strzelecki Warm Temperate Rainforest is the most endangered Ecological Vegetation Class in the Strzelecki Bioregion. 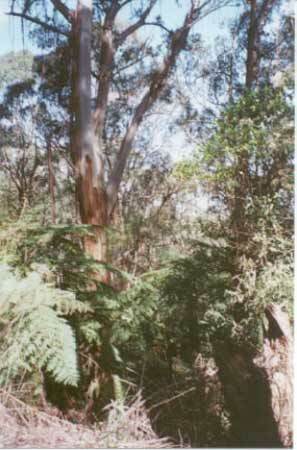 April 2007: Radiata Pine established within one to two metres of warm temperate rainforest on the northern side of Macks Creek. Such buffers have no scientific credibility. 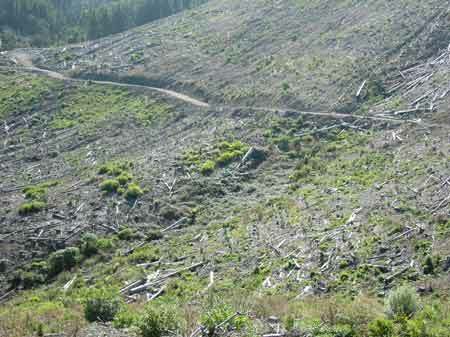 These plantations were replanted after the Forest Stewardship Council audit of 2007, probably so that the auditors wouldn't see them. More information on rainforest buffers here. 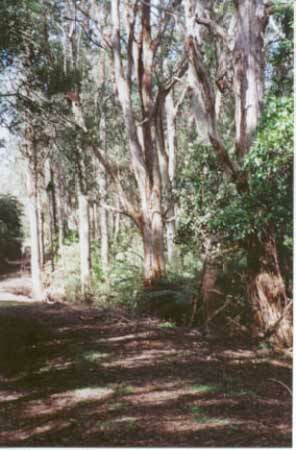 April 2007: Radiata pine established within 1 to 2 metres of warm temperate rainforest on the southern side of Macks Creek. A deliberate provocation of conservationists concerns. April 2007: Macks Creek, north side. Radiata pine was established on this site in 1976. It was logged in 2006 and is now a haven for many weeds. Note infestation of blackberry in this gully line. April 2007: Macks Creek after spraying of herbicides in creek buffer by West Gippsland Catchment Management Authority and Hancock. 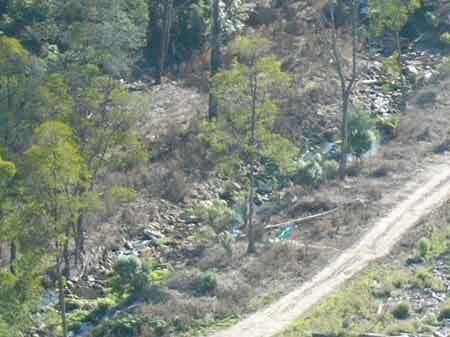 April 2007: Crumbling roading infrastructure in Macks Creek plantation. 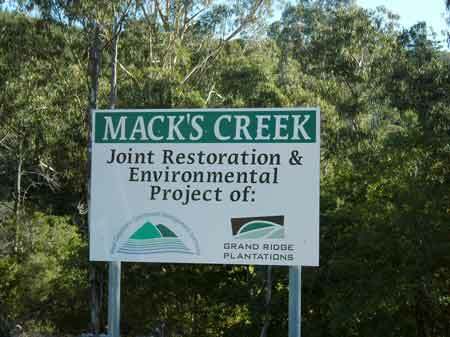 October 2006: Regenerating Warm Temperate Rainforest in Macks Creek catchment. Area within PaperlinX area of supply. Area within Brown and Dureau Softwoods (Morwell) area of supply. THREATENED FISH NOTES - STRZELECKI STREAMS: Habitat for Spotted Galaxias, Mountain Galaxias, Broadfinned Galaxias, Tupong , Blackfish and the FFG listed Australian Grayling. 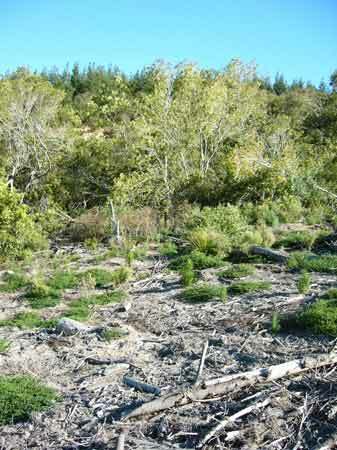 October 2001: Native vegetation within Macks Creek catchment inside Hancock plantation boundary. Male koala heard here. 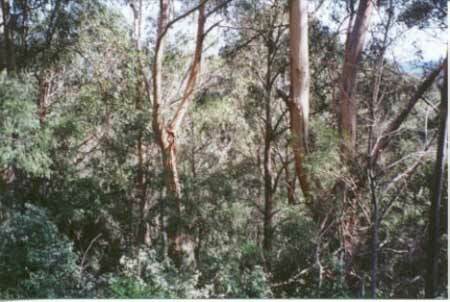 October 2001: Native vegetation within Macks Creek catchment inside Hancock plantation boundary. Kls: Cretaceous (Lower Aptian) Paludal - Strzelecki Group: Feldspathic, lithic sandstone, siltstone and mudstone, minor black coal, quartzose sandstone, conglomerate, local carbonate concentrations. Abundant plant remains. Tvo: Palaeocene/Eocene: Dense augite and olivine basalt, tuff, claystone and siltstone. Often extremely weathered and ferruginized. Tpc: Palaeocene: Coarse pebble conglomerate, coarse micaceous, feldspathic sand, minor fine micaceous sand and clay. Minor secondary silification. This plantation was very likely to be aerially sprayed with 2,4,5-T between 1968 and 1977. The Dioxin TCDD may still exist in soil in this plantation. For more historical data on 2,4,5-T click here. For more information concerning the continuing health crisis concerning 2,4,5-T please forward to here. April 2001: 50 ha sprayed with 140kg Roundup Max, 3000 Litres Metmac and 10 Litres Pulse (a surfactant) in order to kill Blackberry and Bracken. 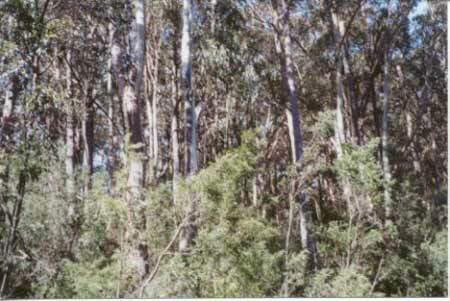 September 2001: 47 ha sprayed with 893kg Velmac G for control of woody weeds (ie regenerating native species). October 2006: Regenerating Warm Temperate Rainforest Species inside pine plantations. 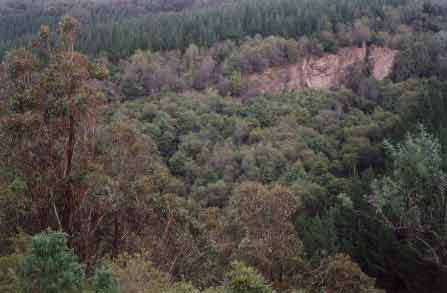 Hancock Watch site visit October 2001: Large Pine Plantation area about 6 km by 5km in size which takes in the greater portion of the Macks Creek catchment south east of Tarra Bulga National Park. Some native vegetation - ash messmate and bluegum on corner of Blackwarry Scenic Road and Roberts Road - north eastern edge of plantation, however some of this may be located inside private land reserve which is also located in LEGL/93-100. Male Strzelecki Koala heard calling about 600 metres south of Blackwarry Scenic Road on Roberts Road in another small stand of native vegetation. The rest of this site appears to be dominated by pine plantations, some of which was being logged. 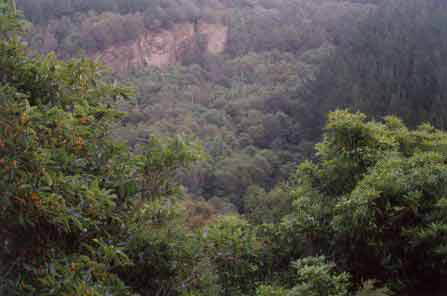 June 2003: native vegetation near stand of Warm Temperate Rainforest in the Macks creek catchment. 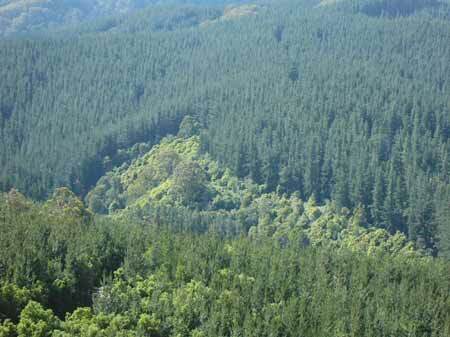 Warm Temperate Rainforest occurs in four very small patches in this plantation and is of national importance. Hancock Watch site visit Nov 01: Travelled south along ‘Bulga Park Road from Baloak. 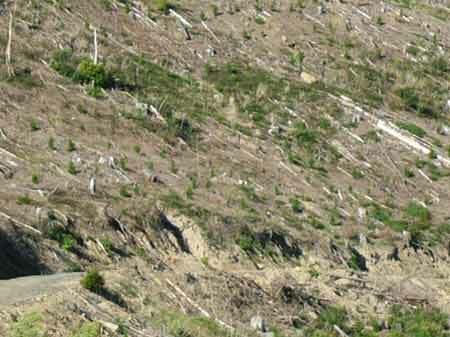 Some of the plantation on the eastern side appears to be on steep slopes. Came upon recent clearing of pine plantations and noted that several tributaries/drainage lines of Macks Creek remained with minimal buffers. From Bulga Park Road a clear view north across the Macks Creek catchment was apparent. 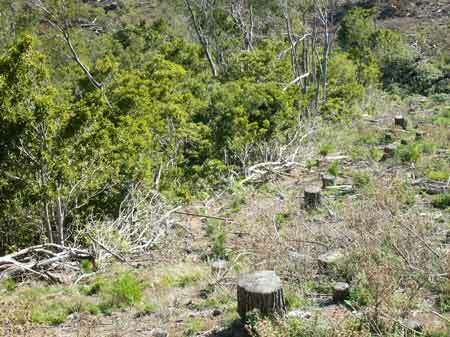 From several positions it was possible to see remnant native vegetation scattered throughout the northern slopes of Macks Creek. This was especially evident of the areas noted above and quite a substantial area on the far western side of the plantation. It was also clear that some regenerating native vegetation was visible south and south west of the quarry that links up with LEGL 93-98. 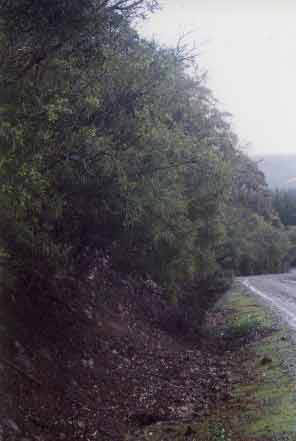 June 2003: Roadsides in this plantation have a large population of Sticky Wattle Rr (Acacia howittii) as seen in this photo along Roberts Road. 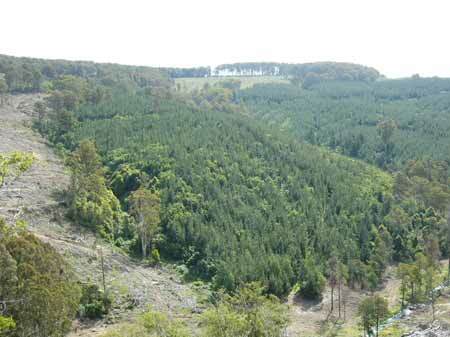 October 2001: Native vegetation within Macks Creek catchment within plantation boundary. Near Roberts Road turnoff. Macks Creek, Calrossie: Fast flowing stream flowing through partly cleared hills, rock and grave bottom. Contains brown trout to 350g, average size very small, abundant small river blackfish, short finned eel, tupong and grayling. Tarra River - Upper reaches: Fast flowing stream running through partly cleared hills, rock and gravel bottom. Access is good but the tributaries are remote and difficult to reach. Abundant brown trout to 400g, average 120g, river blackfish, tupong, grayling and eels. Subject to a blackfish closure. Source: A Guide to the Inland Angling Waters of Victoria by BR Tunbridge, PL Rogan, CA Barnham. Department Conservation and Environment. Arthur Rylah Institute for Environmental Research, 123 Brown St, Heidelberg, 3084. (4th ed - 1991).